"Low End" medium size controller for wingspan from 0,5 m to 1,0 m, outputs for 20 mA LEDs: 2x Permanent / 1x Flashing / 1x Landing. Power 4,5 V-14 V.
NF-1RC units are designed for illumination of the Slow and ParkFly models for flying at night. 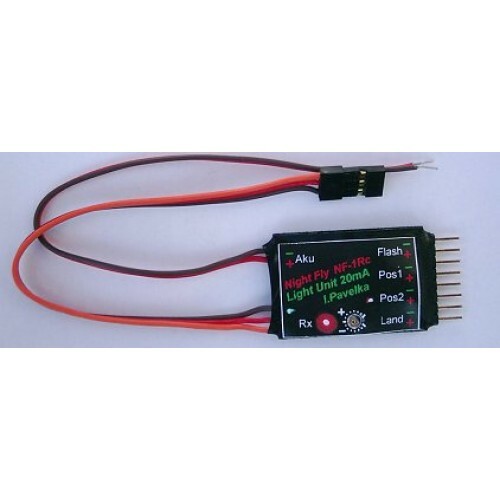 They are designed to power color ultra bright LEDs (Light-Emitting Diode) with the nominal current of 20mA. It contains four independent current-powered outputs. Two outputs are for position lights. The third output is designed to power the anti-collision flash lights and flashes with one-second frequency. The fourth output, being controlled by the receiver, powers the landing lights. The receiver circuit and the light circuits are separated by an opto-coupler. Unit is compatible with Graupner or Hitec-type connectors. The built-in trimmer enables for the control stick to be put into position when it operates. The circuits maintain the nominal current in the wide range of voltage from 6 to 14V without the need to connect compensating resistance series in the circuit. The stabilization starts working from 4.5V, therefore it is possible to connect the unit with the used NiCd or NiMH batteries with 4 -10 cells. As the number of the cells of the powering accumulator increases, so does the number of diodes that can be connected (serially) in one circuit. Using seven-cell-accumulator, 2 green or white diodes and/or 3 red or yellow diodes can be connected in one circuit. The colors of diodes in one circuit can be combined.